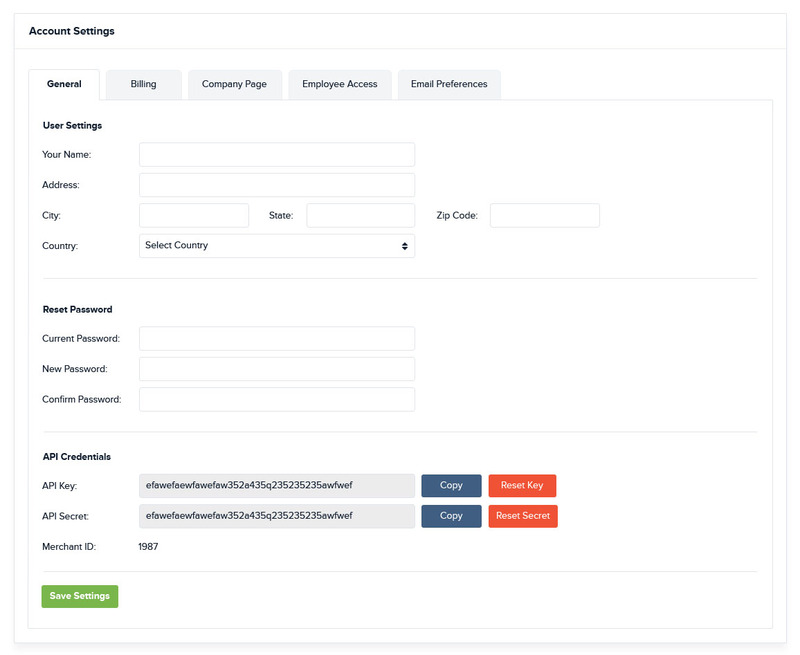 The April 2018 release is entirely based on enhancements that have been requested through customer support and our past surveys. Today we are introducing more than a dozen new features and improvements to the system. 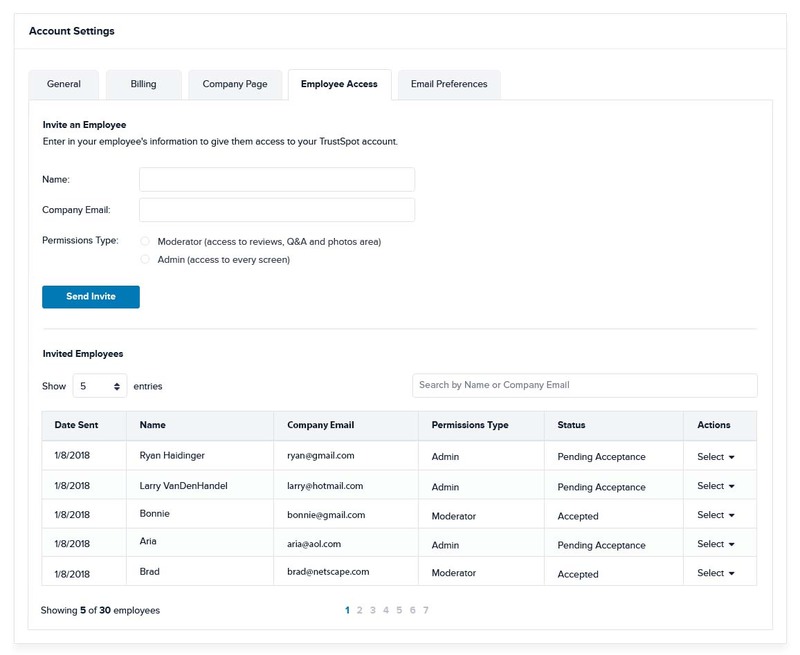 The Employee Access tool is a great way to invite others to access your TrustSpot account with limited permissions. This way you can ensure employees only have access to moderation based pages, while your admins have access to all pages within the account. To learn more about Employee Access, check out our support guide. 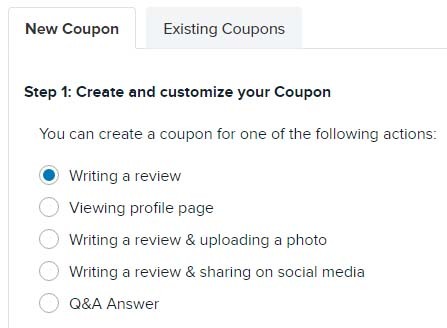 To learn more about the new Coupon Events, check out our support guide. The Product Reviews Carousel is a great way to show off your happy customer reviews directly on key converting pages, such as the homepage or checkout. The Carousel itself is highly customizable, so you can make sure the wording and colors match the branding of your site. To learn more about the Product Review Carousel, check out our support guide. Product Groups allow you to create groups of similar products and aggregate reviews between all of the products in that group. This feature has been highly requested over the past few months, and we're very excited to be launching it today. The most common use case for this feature is if you're offering the same product in multiple sizes or colors and want to ensure all reviews are shown under each other, versus separating out a few reviews on each one. To learn more about Product Groups, check out our support guide. The product blacklist feature is similar to our email blacklist feature. Now you can prevent particular products from receiving review requests. In addition, when a product is on your blacklist, reviews will not display on it's product page. To start using the Product Blacklist feature, go to: Product Reviews > Products and click to Edit a product. To learn more about Product Blacklist, check out our support guide. Collecting customer photos is a great way to show off your content to prospective site visitors. The Photo Gallery allows you to showcase all your photos in a dedicated page on your website. Now when prospective site visitors come to your site, they can easily see all of your visual content in one area allowing them to connect better with your brand and feel more comfortable with making a purchase. To learn more about the Photo Gallery, check out our support guide. Like the Photo Gallery, the Photo Carousel is another great visual tool to show off your photos on your website. The Carousel is a slim horizontal design that works great on any page. Site visitors can scroll through each photo. To learn more about the Photo Carousel, check out our support guide. Instagram is one of the largest hubs for user generated content, and we're excited to now be connected to them. 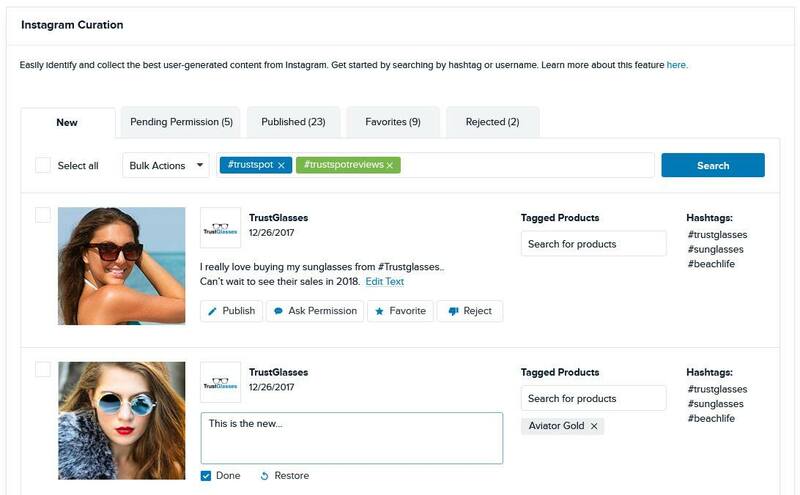 With our Instagram Curation feature, you can discover new photos from your customers and display them to prospective site visitors. 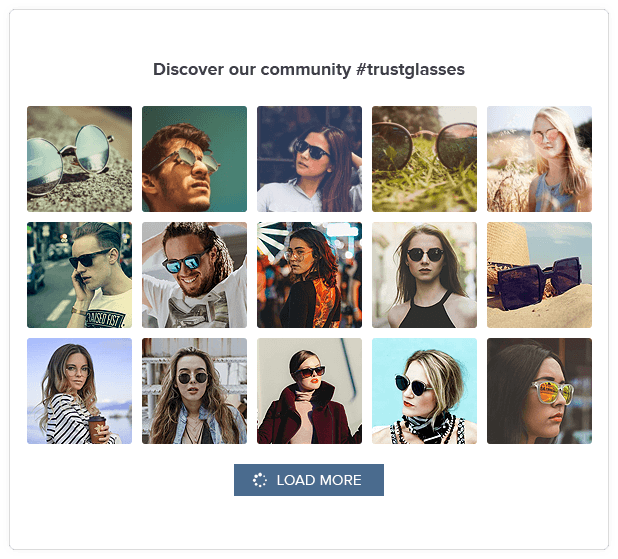 With our additional visual features such as the Photo Carousel and Photo Gallery, you can display both your review & Instagram photos on all areas of your website. 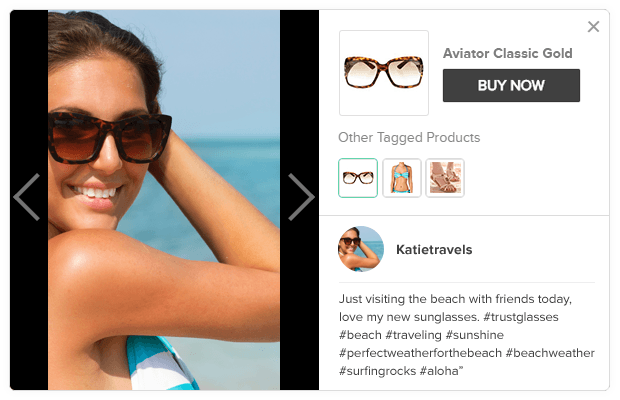 When a visitor clicks an Instagram photo within your Photo Carousel or Gallery, it will display an overlay with the Instagram user's information and photo. Best of all, you can tag products that correspond to that Instagram photo. This gives your site visitors an easy way to check out the product associated with that image. To learn more about Instagram Curation, check out our support guide. In addition to our new account settings, we've also built out a multi-account access feature, which means you can now access many accounts from a single login. Gone are the days of having a unique login PER account, now you can access all your accounts from a single login. To learn more about Multi-Account Access, check out our support guide. We've completely overhauled the design of our account settings area. Since we were introducing the Employee Access screen, this gave us the perfect opportunity to update the rest of the screens as well. The profile page settings were moved from the marketing tab into the account settings area, under the Company Page tab. To access the account settings area, click the top right of your account.